Frogs and toads feature prominently in magical folklore in many societies. These amphibious critters are known for a variety of magical properties, from their ability to help predict the weather, to curing warts to bringing good luck. Let’s look at some of the best known superstitions, omens and folklore surrounding frogs and toads. Frogs appear in a number of folk cures, and are said to treat a number of ailments from epilepsy to whooping cough and tuberculosis. Some cultures believe frogs bring good luck, but others say frogs carry evil spells or curses. In the Bible, a plague of frogs swarms Egypt — this was the Christian god’s way of showing dominance over the deities of ancient Egypt. In parts of Appalachia, it is believed that if you hear a frog croaking exactly at midnight, it means rain is on the way. However, in some societies it’s just the opposite — frogs croaking during the day indicate coming storms. There’s an old British legend that carrying a dried frog in a pouch around your neck will prevent epileptic seizures. In some rural areas, it’s just the frog’s liver that gets dried and worn. Live frogs appear in a number of folk cures. It is believed that putting a live frog in your mouth will cure thrush, and that swallowing live frogs — presumably small ones — can cure whooping cough and tuberculosis. Rubbing a live frog or toad on a wart will cure the wart, but only if you impale the frog on a tree and let him die. Some cultures believe that a frog coming into your house brings good fortune - others say it’s bad luck - the Xhosa tribe says that a frog in your house might be carrying a spell or a curse. Either way, it’s usually considered a bad idea to kill a frog. The Maori people believe that killing a frog can bring floods and heavy rains, but some African tribes say that the death of a frog will bring drought. For the ancient Egyptians, the frog-headed goddess Hekt was a symbol of fertility and birth. If you wish to conceive, touch a frog. The association of the frog with fertility has its root in science — each year, when the Nile river flooded its banks, frogs were everywhere. The annual flooding of the delta meant rich soil and strong crops — so the croaking of millions of frogs may well have been an indicator that farmers would have an abundant season. Frogs have only been in Ireland for a few hundred years, since students from Trinity College released them into the wild. However, there are still some frog folktales in Ireland, including that you can tell the weather by the color of a frog. Ranidaphobia is the fear of frogs and toads. Oh, and when Shakespeare's witches call for a bit of toe of frog? Not related to frogs at all! It turns out that there’s a variety of buttercup known in folklore as “frog’s foot.” It’s entirely possible that Shakespeare was referring to the petals of this flower. Like many members of the buttercup family, this particular species is considered toxic, and can cause skin inflammations. The Victorians associated it with selfishness and ingratitude. "Frog is strongly linked with transformation and magic. Generally frogs undergo a two stage life cycle. They start off as eggs, hatching into tadpoles, limbless aquatic larva with gills and a long flat tail. Legs and lungs develop, and the tail gradually disappears as the tadpole approaches the adult stage. This denotes the awakening of one's creativity. 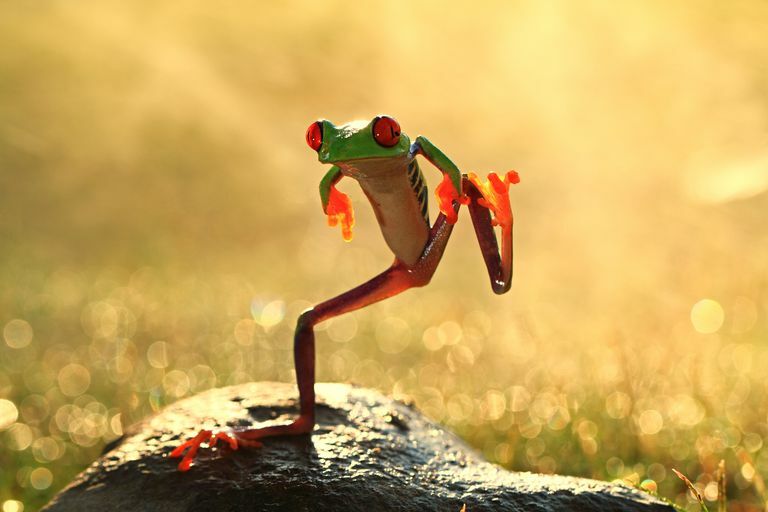 When frog enters your life, it is an invitation to leap into your creative power."